From Letter to Richard Bentley (1693). This quote is from Newton’s correspondence with theologian Richard Bentley, who in 1692 delivered a series of sermons on the subject of “A Confutation of Atheism from the Origin and Frame of the World” at St. Martin-in-the-Field. This course of lectures was the first on the evidence of Christianity established by a bequest from Robert Boyle. In preparing his sermons, Bentley had received Newton’s recommendations, in July 1691, for background information from parts of the Principia which had been published about five years earlier. After Bentley gave his oral presentations, but before publishing them, he consulted with Isaac Newton in several letters, clarifying a number of points regarding gravity and cosmogony, so that he could be sure the printed version of his lectures gave a correct interpretation of Newton’s ideas. The chronology of events (omitting mention of those letters of Bentley's that are not extant) is as follows. November, 1692: Bentley delivers some version of what is later published as his 7th Lecture. December 5, 1692: Bentley delivers some version of what is later published as his 8th Lecture. December 10, 1692: Newton's first letter to Bentley. 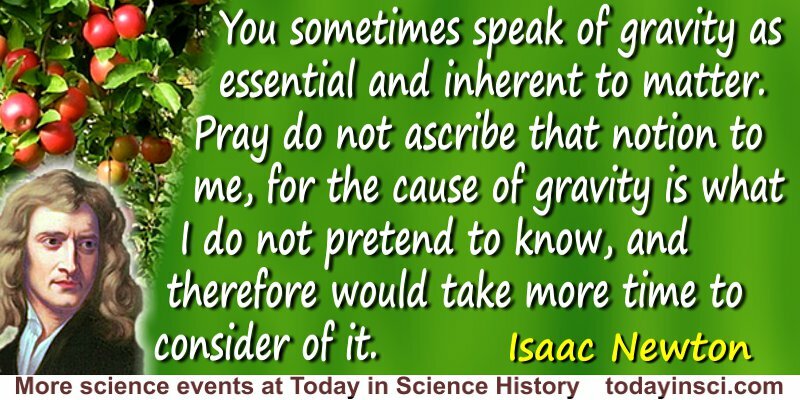 January 17, 1692/3: Newton's second letter to Bentley, asserting that gravity is not essential to matter. 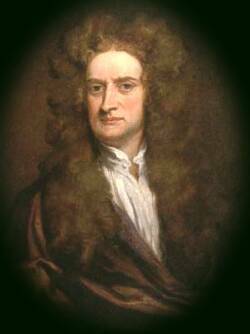 February 11, 1692/3: Newton's third letter to Bentley. February 18, 1692/3: Bentley's letter to Newton, containing an “abstract and thread” of his then-unpublished Seventh Boyle Lecture. February 25, 1692/3: Newton's fourth letter to Bentley, containing his remarks about matter acting without mediation. 1693: The published versions of Bentley's lectures appear. 1756: Newton's letters to Bentley are first published, as Four Letters from Sir Isaac Newton to Doctor Bentley. The letters written during January and February are written with a slash between the years 1692 and 1693 because of change in custom for marking the new year. According to an older tradition, the new year did not begin until March 25th, with the Feast of the Annunciation. The newer practice, ushered in with the change from the Julian to the Gregorian calendar (a change made in England in 1752), was to take January 1st as the beginning of the new year. Documents written during the transitional period before this new custom had fully taken hold, and between January 1 and March 25th, are often dated with a slash between the years.